Figures 1 and 2: View onto the top of the shoulder with the arm stretched out. Clearly visible are the middle part of the clavicle (black mark) but not its distal end. Also easy to identify is the trapezius forming a "crest" like separation of the front and the back part of the thorax (yellow mark). Fig. 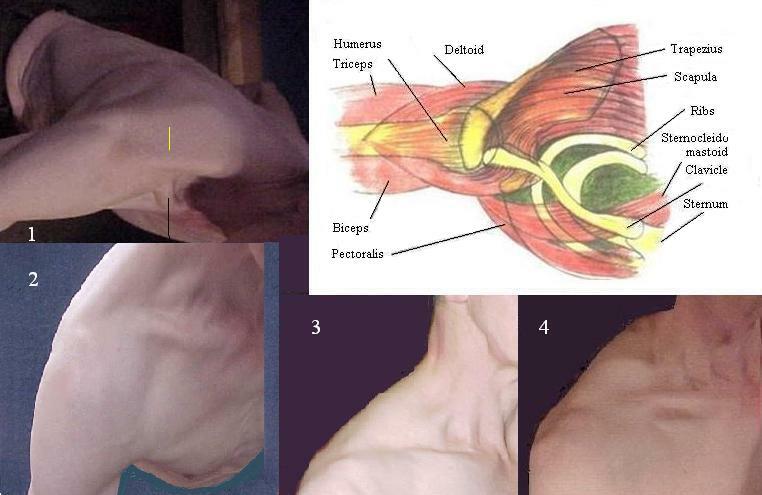 1 also shows the spina of scapula and the acromion presenting as a clearly recognizable groove, a groove not built up in fig 2 as the arm is lifted only moderately. Figures 3 and 4: View on the shoulder the arm kept along the thorax. In both images the distal part of the clavicle is easy to recognize.